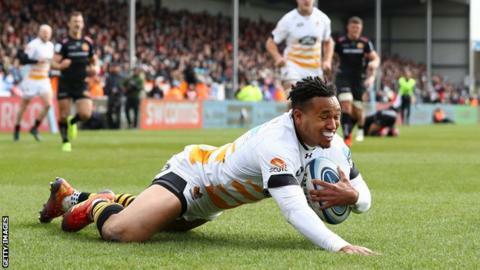 Wasps strengthened their Premiership play-off hopes with a brilliant bonus-point victory at leaders Exeter Chiefs. The hosts, already assured of a home semi-final, had led 12-0 after half an hour through Jack Nowell and Nic White. But Willie Le Roux, Juan de Jongh and Marcus Watson all crossed during a devastating eight-minute spell to put Wasps 21-12 in front at half-time. Zurabi Zhvania secured the bonus point after the break, before Jack Yeandle's try set up a tense final 10 minutes. The visitors had to weather a wave of late Exeter pressure, but held on to move up to fifth in the table, three points behind fourth-placed Harlequins, who they play on the final day of the season. The Chiefs had not lost at Sandy Park in more than 12 months and have been guaranteed a spot in the top four since beating Bath on 24 March. Maintaining their intensity was always going to be a challenge with five rounds still to play, although they appeared to be making light work of Wasps when White touched down to put them 12-0 up. But Dai Young's side, who had never won in nine previous Premiership visits to Exeter, turned the contest on its head before half-time - with Watson's try after a Nathan Hughes grubber kick forward capping a clinical period of attacking rugby. Georgia prop Zhvania showed great hands before crossing for Wasps' fourth try after the break, only for Yeandle to then haul the hosts back to within seven points again. The away side, however, were not to be denied and they remain in the race to finish fourth - which, if they are successful, would likely set up a repeat of this match in the semi-finals. "I'm not going to say it wasn't a little bit expected - I think for any team to qualify for the semi-finals like we did, at some stage you're going to draw breath. "Now that's happened, we've got to reset ourselves both mentally and physically this week, and I actually think we will. "Sometimes you need something like today to really rezone your focus. Last week we were absolutely razor sharp at Leicester, but we weren't today and we paid the price." "It didn't look good after about 15 minutes but I couldn't be prouder of the players today. "We were under pressure for big parts of the game but I thought we dug in, we worked for each other and we played some good stuff as well. "I don't think Exeter played poorly - they chucked everything at us and we stood up to it. "We wanted a statement win before the end of the season and that was a statement win, but we need to back it up." Exeter Chiefs: Cordero; Nowell, Slade, Devoto, Woodburn; Simmonds, White; Moon, Cowan-Dickie, Francis, Lonsdale, Atkins, Ewers, Armand (capt), Kvesic. Replacements: Yeandle, Hepburn, Williams, Salmon, Capstick, Maunder, Hill, Whitten. Wasps: Le Roux; Watson, Daly, Lovobalavu, Bassett; Sopoaga, Simpson; Zhvania, Cruse, Cooper-Woolley, Launchbury (capt), Gaskell, Shields, Carr, Hughes. Replacements: Johnson, McIntyre, Brookes, Rowlands, Morris, Hampson, Miller, de Jongh.